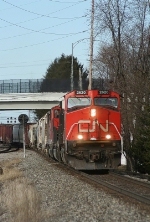 Description: South bound CN haulage train. Description: Shot into the sun but we don't pass up CN. Description: S255 had a hard time getting to Taft this day & outlawed at Kaley Yard, where A779's crew took over for the short trip south. Description: As I was leaving Flint to head home, I spotted this westbound leaving Bristol Yard from I-69. Shortly there after I heard TD3 calling to tell him that he had work to do in Durand. Got off the highway just west of Swartz Creek and headed for East Durand. 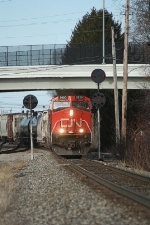 Here's CN 391 coming onto the double track while slowing for the yard work in town. Description: Southbound CN freighter, enroute to MacMillan Yard, approaching Vivian Road siding.